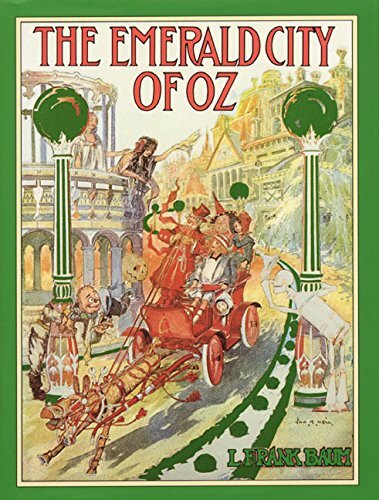 I hope you have downloaded a copy of The Emerald City of Oz, and are reading along with me. These are really quite short chapters, and quick and easy to read. In this Chapter, we see that L. Frank Baum understands where we are at today, economically. Uncle Henry had to build another house at some point previous to our story, because a cyclone took away his other one. Because he is a poor man, he had to mortgage his farm. Now he is over-due on his mortgage payment; and, the banker is going to take it all away, unless he can pay. Both Aunt Em and Uncle Henry are concerned for Dorothy's well being. Em and Henry plan on moving and looking for honest work somewhere. They fear they won't be able to support Dorothy as they have in the past. It isn't clear to any of them what Dorothy will be able to do to make money. They talk about Dorothy going away to live in fairyland. Uncle Henry is the most skeptical. Dorothy promises them that she will return before they have to give up the farm. Dorothy goes into the attic at at the prescribed time, and she makes the secret sign given to her by Princess Ozma of Oz. Dorothy vanishes from the attic in Kansas and is transported instantly to fairyland. When Aunt Em and Uncle Henry go to check on the little princess, she is gone! Dorothy has a plan to save the farm. What do you think it will be? What will happen when the angry Nome King finds out that Dorothy is back in fairyland?